Seaspray Villa not only allows you to enjoy all the amenities of being part of the Tryall Club, but it feels like a mini resort all on its own. The villa’s spacious floor plan is great for large families or groups vacationing together. The sand and surf is just a few steps away so you can jump into the waves whenever you feel like it. At the end of a long day, come back to the villa and relax in the hot tub as you watch the sunset. Seaspray Villa also comes with a fantastic staff to prepare meals, wash your laundry, and take care of everything during your stay. 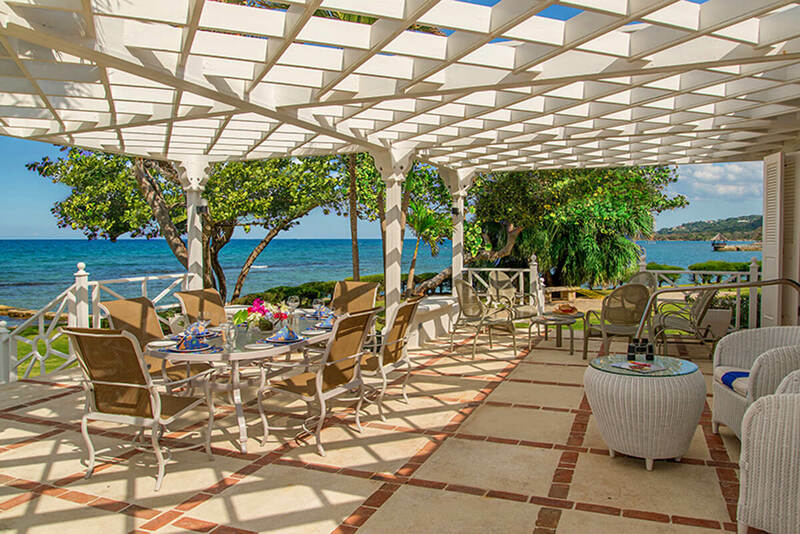 Seaspray Villa is set on beachfront property in the Tryall Club and surrounded by lush flora and greenery. One of the most unique aspects of Seaspray is the waterfront mural painted on the side of the home. The large outdoor terrace provides dining for eight, and several sitting areas dot the lawn so guests can spread out across the property. The long pool is great for swimming laps, with plenty of lounge chairs for sunbathing. A large, round table sits nearby for a round of cards or a board game. A shuffleboard court is tucked away on the lawn, and the Jacuzzi sits between the ocean and the pool. The villa’s lofty ceilings and oversized windows open up the home, and the living room’s nautical decor and flat screen TV with cable creates a fun gathering space inside. The formal dining room seats 8, and cocktails from the wet bar adds a tropical touch. With a full staff, guests won’t have to step foot in the kitchen or laundry room. The main house has three of the bedrooms, and the fourth bedroom is located in its own private cottage. The master bedroom has a king-sized bed and ensuite bath, while the guest bedrooms each have two twin beds and an ensuite bath. All three bedrooms have private patios that open to the terrace or lawn. The guest cottage bedroom is furnished with twin beds and an ensuite bath. It opens to the pool deck and has ocean views. Enjoy afternoon tea at the Great House, or take a trip down to the beach or golf course for a day in the sun. Guests have full access to all Tryall Club amenities, like complimentary golf carts and beachside service.